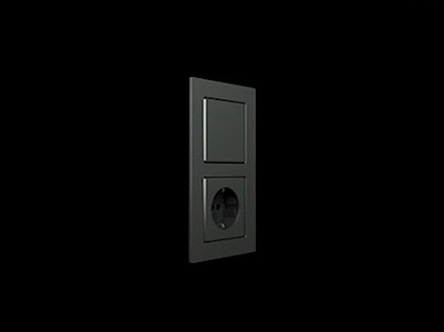 In addition to conventional flush-mounted installation, the Gira E22 switch range offers the option of an installation procedure that results in a frame which is just 3 mm thick when installed on the wall. Gira E22 is available in aluminium. Should a stainless steel variant be required, theGira E2 flat installation is a suitable alternative. The Gira E22 is able to meet the exacting demands of intelligent building technology thanks to its great depth of range. The switch range includes over 280 functions for all mounting types. Most of these functions can be installed flush with the frame . However, some exceptions cannot be installed flush with the frame due to their design . These include elements such as the hygrostat, wireless room temperature sensor, Info Display, and the surface-mounted home station from the Gira door communication system. Prepare a rectangular cut-out, mount, align, and fix the E22 flush-mounted device box using plaster, for e.g. (There are two alignment aids on the box for the exact positioning of the spirit level.) Insert the plaster guard provided and plaster the wall. Remove the plaster guard and cut the opening clear. Insert the E22 device box into the E22 flush-mounted device and align. Screw E22 device box in with claws. (Mounting as with a standard cavity box.) The device box can be corrected by up to 3°. Install the device and cover frame into the device box in the usual way. Finally, mount the design cover plate on the device. Prepare a rectangular cut-out using the template included and mount and align the E22 device box. Screw E22 device box in with claws. (Mounting as with a standard cavity box.) Install the device and cover frame in the usual way. Fit a 58 mm flush-mounted device box in the wall. Install the device and cover frame into the device box in the usual way. The Gira E22 can be installed flat on the wall in 1-gang to 4-gang frames. 1-gang to 5-gang frames can be used for mounting in a 58 mm flush-mounted device box.